See below for biographical note. 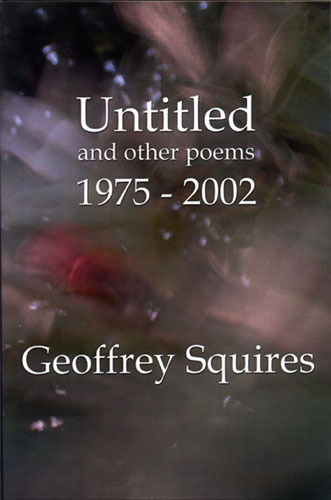 This volume collects poetry from ten major works by Geoffrey Squires, from Drowned Stones of 1975 to Untitled III of 2002. As the American critic Robert Archambeau has noted, Geoffrey Squires' poetry has few relations on either side of the Atlantic. While his early writing bears all the hallmarks of modernism, his increasing preoccupation with consciousness and perception has led over time to the lyric abstraction of his later work, in particular the Untitled sequences. Click here for list of contents. Geoffrey Squires was born in 1942 and grew up in Co. Donegal. After reading English at Cambridge he lived and worked in various countries including Iran, France and the United States, and is a translator of French and Persian poetry. He is married with two children and now lives in England.